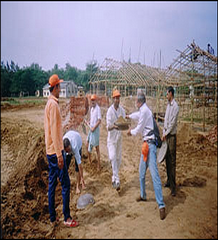 The Chamoli district of Uttar Pradesh witnessed an earthquake of magnitude 6.8 on Richter Scale in the early hours of 29 Mar 1999, causing extensive damage to property and loss of several lives. The impact of the earthquake was comparatively more severe in the districts of Chamoli and Rudraprayag.After an emergency meeting in Delhi, the base camp was established at Gopeshwar. Medical aid was provided as immediate relief in several villages. The quake destroyed the shelters of the poor villagers. After a week, Sewa Samiti decided to visit those areas, which were still out of range of providing rescue aids. A village was spotted 3 hours away from the base camp. Arya Veers have to travel this distance on foot. The scene of that village was awful. No outside aid could reach there till date. The condition of villagers was pathetic. No single house was remained undamaged. As the more relief material was reaching, the rescue operation was getting the pace. AryaVeers built houses to provide proper shelter to villagers.Meanwhile, one more unfortunate incident occurred, when a leopard captured a girl and took her away to jungle. Sh. Jagveer Arya ran after the leopard. After a clash of more than 1 hour, leopard left the field and the girl was saved. AryaVeers did voluntary service for more than 20 days in Chamoli in the leadership of Sh. Jagveer Arya. जातिवाद के असली पोषक, मनु या तथाकथित नेता?